This month we look back at a few of our favorite films directed by the celebrated French New Wave auteur Agnès Varda. Varda passed away just last month at the age of 90, prompting an outpouring of appreciation from the film community. 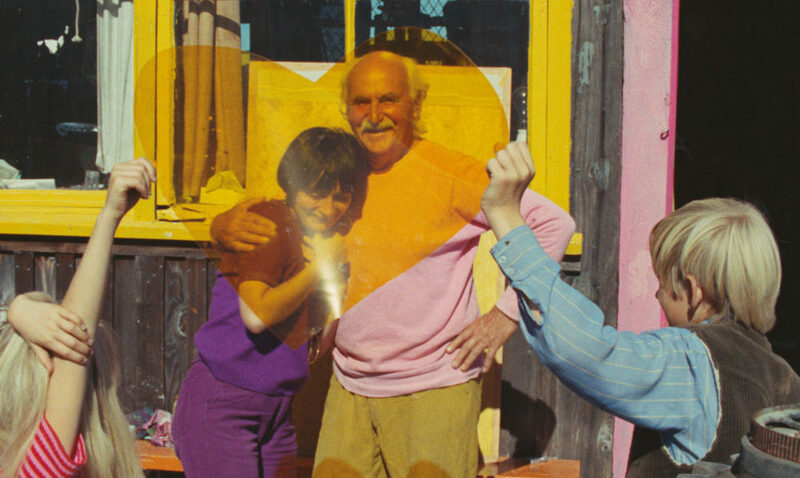 Varda leaves behind an assortment of photographs and documentaries that chronicle much of the 20th century and early 21st century from her perspective. In addition to her non-fiction endeavors, Varda succeeded in directing fictional films, a number of which remain influential to this day. Astonishingly only Agnès Varda’s second feature film, Cléo from 5 to 7 is a breathtaking masterpiece of humanism and existentialism. Playing out in quasi-real time, the film walks in the shoes of Cléo (Corinne Marchand), a Paris urbanite and moderately popular singer who wanders around the city for roughly two hours (hence the title) while she awaits results from a cancer screening. We follow her about her day through cafés, boutique stores, cinemas, and parks alike, meeting with various friends and trying to bury her health anxieties to no avail. It’s abundantly clear from almost her first interaction with anyone that Cléo is a rather superficial person, but that doesn’t stop Varda from allowing us to empathize with the growing realization of her own mortality. To her credit, Corinne Marchand plays Cléo wonderfully, internalizing her fear into a fake facade of confidence, imbuing emotional and psychological depth into an otherwise shallow character. The ending to her story is perhaps one of my favorite endings in any film, shot with a startling composition that brings the existential weight of her plight into remarkably lucid focus. Agnès Varda’s 1965 Le Bonheur is a brief 80-minute film that packs a surprising punch. The film follows François (Jean-Claude Drouot), a youthful carpenter living a beautiful life with a beautiful wife Thérèse (Claire Drouot) and two equally beautiful children. He’s already happy, but nevertheless initiates an affair with a young telegram office employee (Marie-France Boyer). We watch as François lives out this joyful new life he has paved for himself, spending time with his mistress in the afternoon and his wife at night. His wife and children both sense his greater contentedness, and eventually he cannot keep his secret from the former. François amicably discloses the affair he has been having, claiming that it is by no way an indication of Thérèse’s inability to please him but rather an extension of the love and happiness he already feels for her. François explains his motivations so sincerely and without malice that we almost believe him- it’s certainly clear he believes himself. Yet it would be naïve to expect his infidelity lacks consequences, and the film’s unexpectedly dark conclusion is a brilliantly satirical gut punch that makes a mockery of the male entitlement it has thus far depicted without comment. What makes Le Bonheur so effective is the tonal engagement with which Varda allows the film to participate. For all 80 minutes of its runtime, the film plays out in the male perspective of François- firmly within his headspace and understanding his actions, though never going so far as to agree with them. Every corner of the film’s style is warm and pleasant. Its color design is vivaciously bright, its fast French New Wave editing conveys the attraction between François and his mistress, and its shrewd use of Mozart as background noise is blissful. Yet it’s not until the very end that we realize the full extent with which Varda has been mocking the film’s privileged gaze. Le Bonheur’s final shot mirrors its first in the most ruthlessly cynical of ways, a brilliantly cinematic punctuation mark to its rather alarming thesis statement. Uncle Yanco was Varda’s first American documentary. It is a short film following Varda as she visits a long-lost family member. Though she calls the man Uncle Yanco, it’s noted in the film that the pair are second cousins. The two estranged cousins have never met before the filming of the movie, but the connection is instantly clear and it is apparent that Uncle Yanco is most assuredly a Varda. He is something of a silly character though, like Agnès, he has an acute ability to make wise and insightful observations in between bouts of silliness. He lives his life with an apparent joy, and he is nothing but thrilled to be introduced to Agnès. Their introduction itself is a playful moment which pushes the bounds between documentary and fiction, as we see the two reintroduced several times, speaking the same lines in different languages. The film is filled with color and Uncle Yanco is surrounded by his own artwork, some kind of peculiar fusion between traditional European painting and the artwork of the beatnik generation in America. Again we are reminded of the certain bloodline shared between the two as Uncle Yanco’s art has the same sort of delightful strangeness as Agnès’. In the short twenty minute run time, we do feel that we’ve gotten to know Uncle Yanco and we get to experience, through a young Agnès’ eyes, the joy of this brief meeting between estranged but somehow familiar family members. Critics often compare Vagabond to the likes of Citizen Kane or Ulysses, but Agnès Varda’s first feature after an almost ten-year break is all her own. 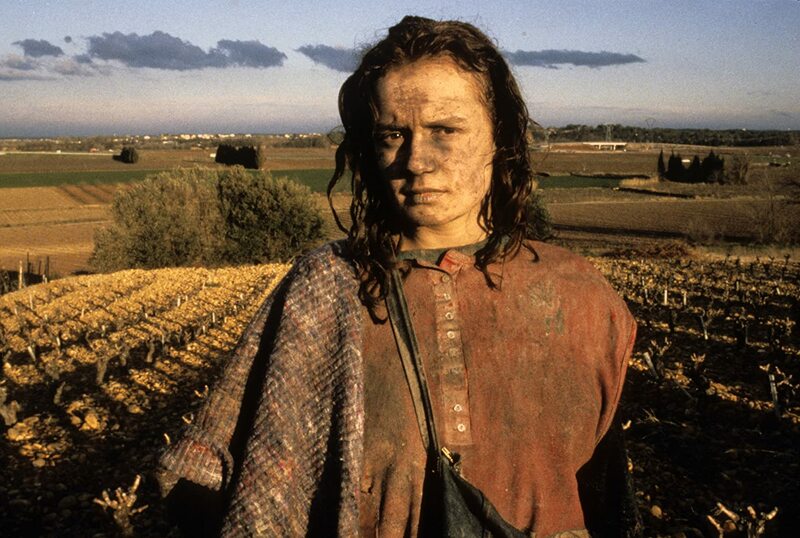 It opens with Mona (Sandrine Bonnaire), the titular vagabond, being found frozen to death in a ditch. Through the use of flashback, the audience sees the last few weeks of Mona’s life, filled with a series of encounters with people of varying backgrounds intent on helping her. Going off two of her great artistic strengths, Varda blurs the line between documentary and fiction. Her blending of real-world events and fictional characters is nothing new at this point, but it has never been done so masterfully. She guides the audience through the same harrowing journey as Mona’s, while providing an unflinching look at the condition of contemporary France at the same time. In The Gleaners and I, Varda documents the lives of various types of gleaners. In this context, a gleaner is not specifically associated with agriculture, though that is an element of the film, but rather more so associated with anyone who collects the unwanted refuse discarded by society that lacks aesthetic beauty that “sells”. She talks to people who repurpose junk as art, people who scavenge for discarded fruit and vegetables to feed the needy, people who clean litter off the streets, and even one man who poaches unwanted food from abandoned marketplaces and eats it right off of the ground. In Varda’s intimate way, she examines the beauty in collecting what society deems as trash. She lingers over decomposing vegetables and admires their form rather than turning her nose away at the idea of rot. 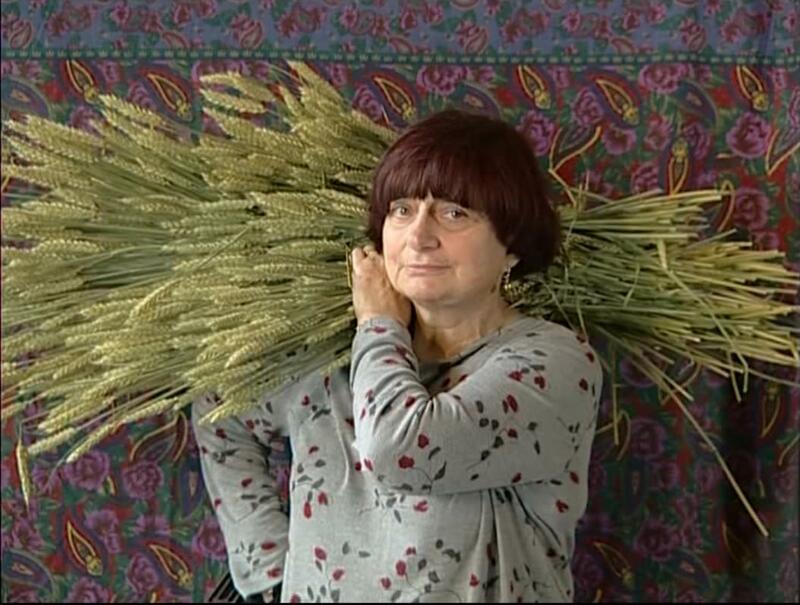 In typical Varda fashion, The Gleaners and I is not an objective work. On the contrary, Varda incorporates herself directly into the film. In addition to her interactions with the gleaners, we see her travelling from place to place, filming the road around her. We often return to the motif of her filming her own hands. She notes her wrinkles and comments on her age and her impending nearness to death, a theme which hits even harder watching the film only days after her passing. She, like the decomposing fruit that has been left behind in farms and marketplaces, can see the visible signs of time passing. We also see her insert her own experiences during this time seeking out the gleaners. In one sequence, she stumbles upon a painting of gleaners in a thrift store and feels that she must buy it given the delightful coincidence. It’s difficult to watch The Gleaners and I and not be delighted both by Varda and by the marginalized figures she interviews and watches. 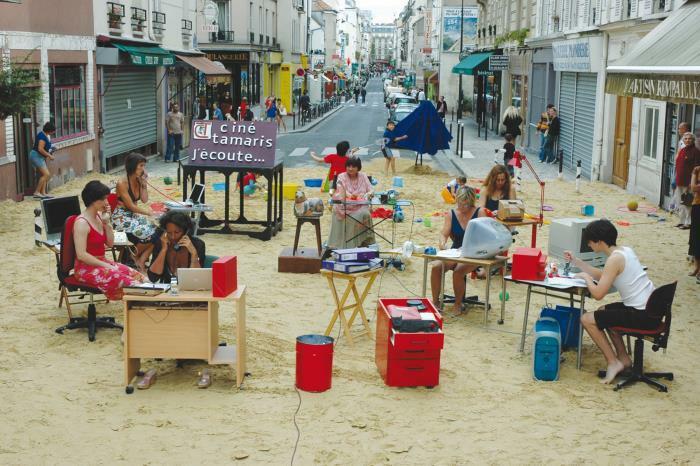 Documentaries like The Beaches of Agnès portray both that is ordinary and incredible in life. Though few of us will attain the level of celebrity that Agnès Varda achieved in her life, through her documentary we see how her life is, at its very fundamental core, ultimately similar to that of our own. Like ourselves, Varda grew older with every year. Like ourselves, Varda lost friends to the passing of time and misses their presence in her life. Like ourselves, Varda experiences sentimentality when recalling experiences in her life and revisiting her childhood. And, most importantly, though perhaps different from some of ourselves, Varda possessed a cherished sense of humor and an ability to humble herself and her accomplishments when in front of the camera. The Beaches of Agnès examines Agnès Varda’s life starting from her childhood and concluding at the present day (2008 at the time). She uses several means to recall her past including recreating scenes with actors (sometimes placing herself into the scene), mixed media, and documenting her experiences as she comes into contact with items and people from her past. Varda uses her documentary not only to reflect on her life, but also to reflect on history. She depicts German soldiers packing Jewish children into trucks in German-occupied France, shares her photographs of the Black Panthers in LA, and mixes her telling of history with her telling of the development of the French New Wave and her involvement in the film movement. At eighty years of age at the time, Varda has amassed a lifetime of stories to tell, so much in fact that the last hour of the film feels as if it were a blur, no doubt mimicking how the passage of time feels in one’s life as one grows older. The scene that is perhaps the most telling in The Beaches of Agnès is one where Varda shares that if a film isn’t to be financially successful, it should be worthy of awards to provide justification for creating. Varda’s camera trails over the accolades laid on the beach that her and her husband, Jacques Demy, have amassed over the course of their careers. The awards are then showed being covered by the sand over time, allowing audiences to grasp a truthful yet rarely spoken conclusion about life and one’s accomplishments.